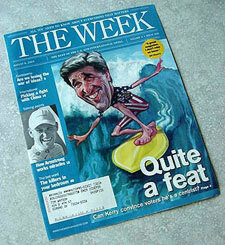 The Week is a great newsmagazine that digests articles from other media in a variety of subjects. It is a joy to read. Bothered by some poor design across the flag at the top, I sketched some layouts and proposed the one below. • The thick & thin serif font used for the subheads doesn't hold up well when set in reverse. 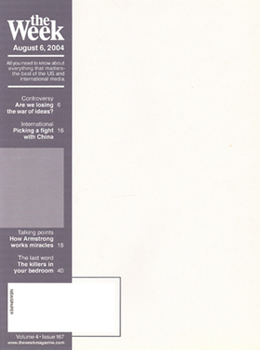 • The double lines of varying thickness are busy, clutter the top and distract from the picture and the headlines. 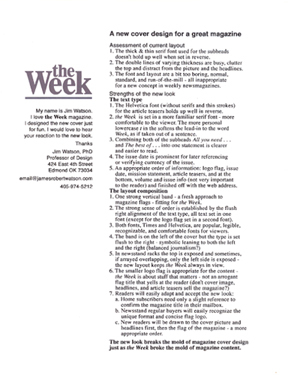 • The font and layout are a bit too boring, normal, standard, and run-of-the-mill - all inappropriate for a new concept in weekly newsmagazines. • The Helvetica font (without serifs and thin strokes) for the article teasers holds up well in reverse. 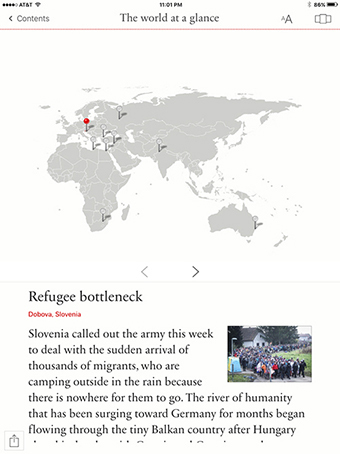 • the Week is set in a more familiar serif font - more comfortable to the viewer. The more personal lowercase t in the softens the lead-in to the word Week, as if taken out of a sentence. • Combining both of the subheads All you need . . . and The best of . . . into one statement is clearer and easier to read. • The issue date is prominent for later referencing or verifying currency of the issue. • An appropriate order of information: logo flag, issue date, mission statement, article teasers, and at the bottom, volume and issue info (not very important to the reader) and finished off with the web address. • One strong vertical band - a fresh approach to magazine flags - fitting for the Week. • The strong sense of order is established by the flush right alignment of the text type, all text set in one font (except for the logo flag set in a second font). • Both fonts, Times and Helvetica, are popular, legible, recognizable, and comfortable fonts for viewers. • In newsstand racks the top is exposed and sometimes, if arrayed overlapping, only the left side is exposed - the new layout keeps the Week always in view. 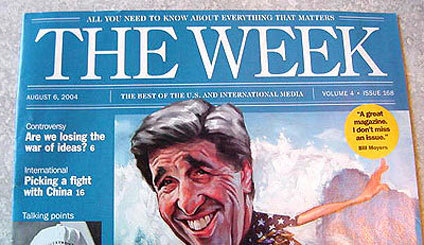 • Home subscribers need only a slight reference to confirm the magazine title in their mailbox. 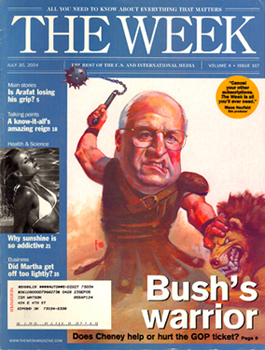 • Newsstand regular buyers will easily recognize the unique format and concise flag logo. • New readers will be drawn to the cover picture and headlines first, then the flag of the magazine - a more appropriate order. • The layout can be easily adapted for the Week website. The new look breaks the mold of magazine cover design just as the Week broke the mold of magazine content. 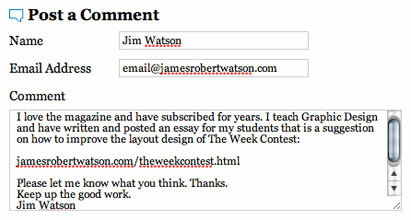 The design of the letter I sent to the editors. This is a regular feature in the magazine, The Week. Its a good magazine, but this page can be laid out to be comprehended more clearly. In the example of the existing layout on the left, there are 3 bits of info: This week's question, Last week's contest, and How to enter (this week's question). The entry instructions (listed third) refer to this week's question (listed first) - the sequence of the info is This week, Last week, This week. Design problems should be assessed and solved while looking through the eyes of the user, reader, audience, target market. Most bad design is a result of a designer creating solutions without researching and considering the target audience of the piece. 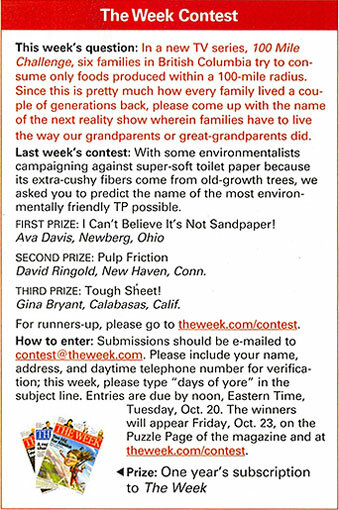 I suspect more magazine readers are interested in reading the funny entries to Last week's contest than are interested in entering This week's question. Therefore, the design should recognize that and lay out the information to accommodate that audience - by putting the winning entries first (or bolder, in a box, in color - something that allows the reader to access the information that is most important to him/her). Simply group like information together in proximity. 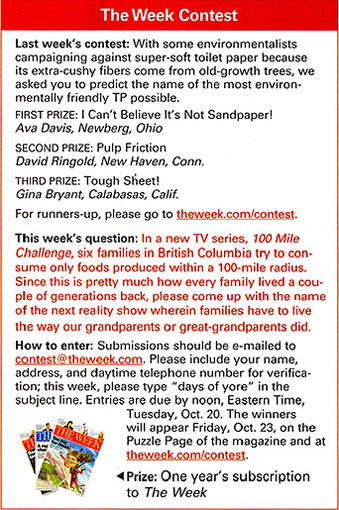 How to enter should follow This week's question, as shown above on the right. Great. Thanks. I look forward to checking the magazine for improvements. The editor has yet to make the change.